I see a comfortable laziness forming at the Society. We're throwing around names like Whole Paycheck, Zupan's, Berkeley Bowl, Pastaworks, and "the co-op". It's no wonder we all ended up with the same fancy Italian tin. And now. French Filllets with Lemon. We are picking up fish at our local fancy food stores, drinking our fancy beers, eating our fancy cheese. Fancy Delicious Fish with no Epicurean Challenge. Fancy Boys. So today, I went out looking for something different. I went down to the International MarketPlace in Berkeley (SP & University). They have a variety of stores there. I saw this in the mercado. El Mexicano is a name I'm quite familiar with. But I thought I better leave these for oldschooly, cause I know the selection in Boise must be limited. Then I went to Indus Foods. Indian/Pakistani grocer. 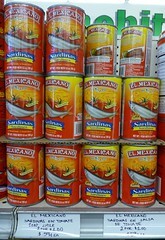 And found Calvo Spiced Sardines in Vegetable Oil. Two big fish in an OK oil. Moroccan. I don't know where the "spice" is but they are fine. I like how it says All content not treated genetically on the box. $1.28. Three out of Five tins. Barely. Enjoyed with Red Pills and Tabasco. A lot of Tabasco. Are there bones in these things? On "Top Chef" last night the contestants had to filet two sardines in front of Eric Ripert. They mostly butchered the little fish. These canned jessies must be boned by machine?? I've never eaten one. Boned? 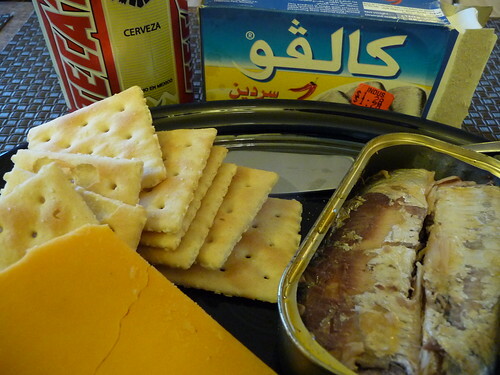 I'm surprised that there is anyone that hasn't eaten sardines. It's rather like saying you've never eaten a hotdog. For chrissake buy a can and eat some.